This Storm Tropical Breeze bowling ball combines the tough colors of carbon and chrome (with a cinnamon fragrance) to create a ball that will appeal to bowlers of all skill levels. Just like other Tropical Breeze bowling ball this one features the Reactor Pearl reactive coverstock. This cover allows the ball to ease through the heads of the lane, and combined with the Camber core's inverted light bulb shape offers pin carry down-lane. I was looking for a ball to fill a void in my bag for a late game ball to use once the lane has been completely worn out (broken down) or those nights when my hook just isn't working. I wanted a light cored ball that I can send up the middle but that will retain enough energy to mix up the pins on impact. The Storm Tropical Breeze was recommended. To note this is my first Storm ball. I had it drilled for control. My experience with this ball shows it to be tame and predictable. I can throw this ball almost as straight as a plastic ball by dialing back on the revs if needed. Otherwise it will pull 5-7 boards very consistently. I can't say this is a great ball but it's not terrible either. It fills the previously noted void well but definitely is not my primary ball. One thing I have to ask...what is with the scented balls? I don't get the point. I already recommended this ball to others. This is my second ball and was added for picking up spares. It's okay, I would only buy 1 though. Is the Tropical charcoal/ chrome the same as the tropical breeze ? Hello! The Tropical Breeze is the name of this particular bowling ball line from Storm. The Tropical Breezes come in a variety of colors. 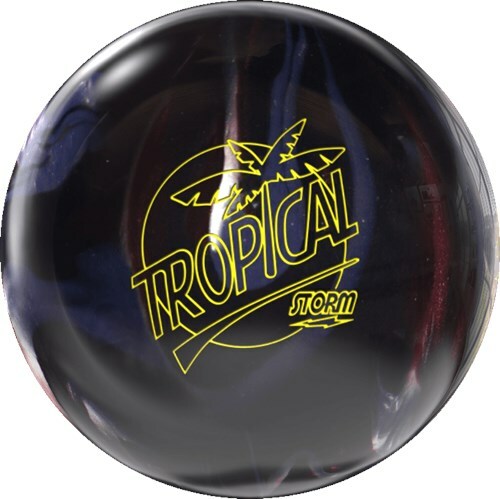 If I order this ball in charcoal/chrome, will I receive the Tropical Storm or Tropical Breeze model? 11/16/2017 - By Fred L.
It will be a Tropical Breeze but it will not say that on the ball itself. It will just say Tropical. They are changing the style of the balls. They are still the same but with a different name plate. Yes, you can either have bowling.com drill it for you and you would specify what hand you bowl with or you can take it to your local driller and have him drill it for a lefty. This would be a great ball if you are just starting out. It will have a slight hook to it. Due to the time it takes to produce the Storm Tropical Breeze Carbon/Chrome ball it will ship in immediately. We cannot ship this ball outside the United States.